Tis’ the season for canning! Right about now your garden is probably giving you a harvest every day. 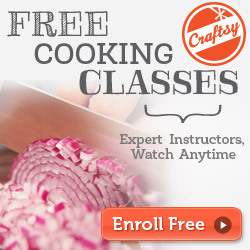 If you don’t have a plan for cooking or preserving these veggies, they can add up fast! A great way to use them is canning! 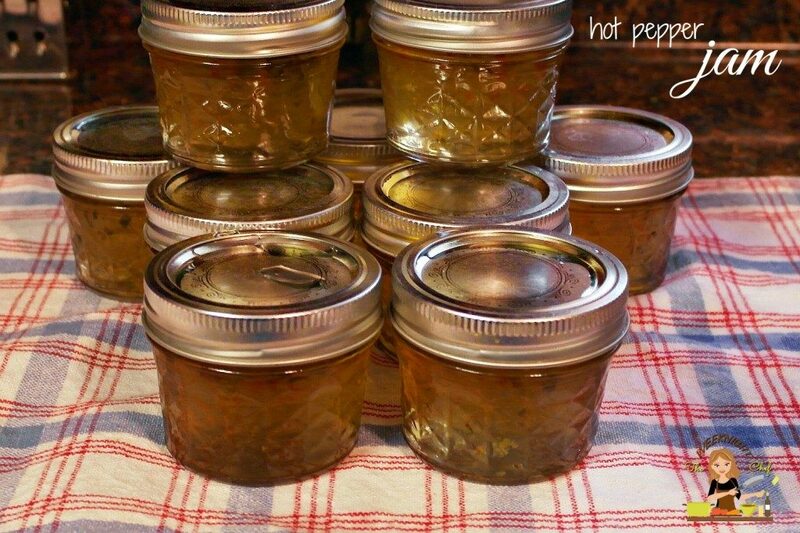 Canning can be intimidating if you have never done it or are just beginning. One thing to remember is that you have to follow every recipe and process exactly. 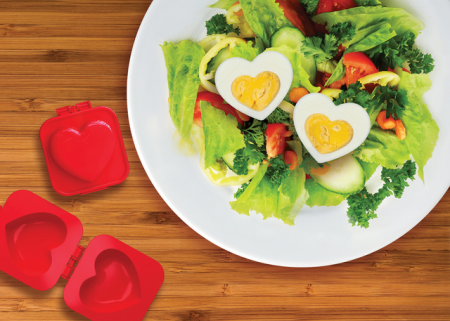 No cutting corners, it is important to ensure food safety. The good thing…. You won’t need to go out and spend $100 on new canning equipment. As long as you have a pot that is deep enough to cover the tops of your jars with water, you are good to go. 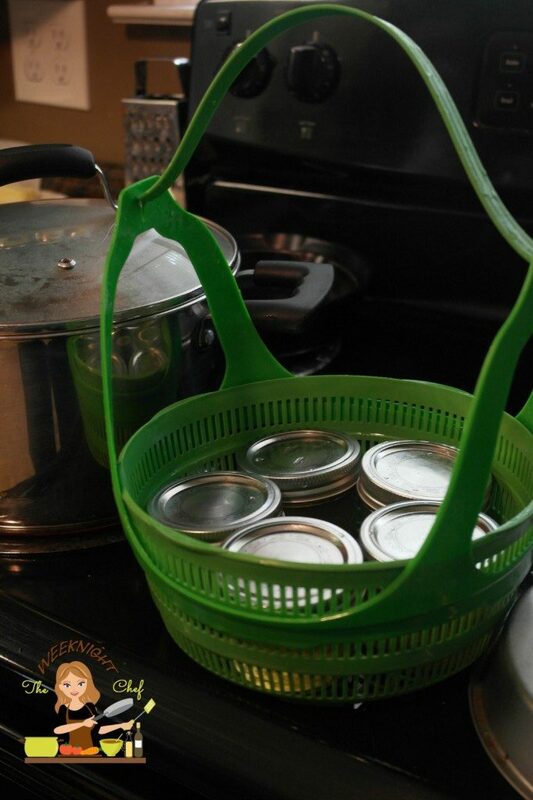 I recommend a Ball Canning Basket (pictured below) or a rack for inside your pot. I use the basket, it is easy, just load it and drop in the water. No tongs required to take it out. 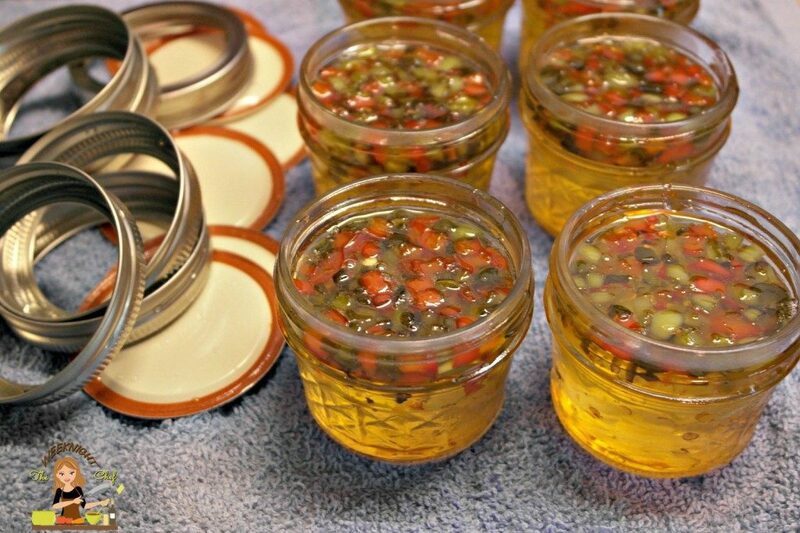 TIP * Make the canning process smoother by staying organized and clean! Stay on track, put away anything you are finished with and clean up as you go. What you need: It may look like a lot, but it isn’t. Place all jars, lids and bands in a clean sink full of straight hot water. Let stand at least 5 mins. to sterilize. Place on a towel to air dry while you work. Very finely chop the peppers. 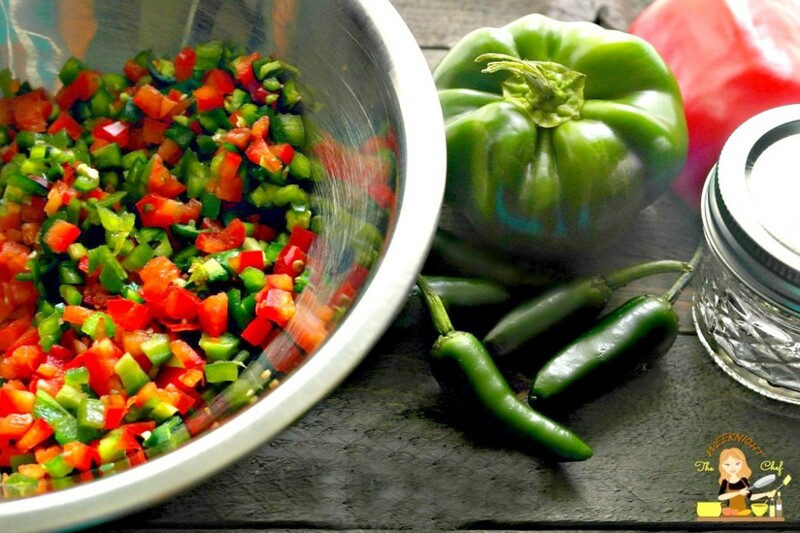 Bring the apple juice, vinegar and peppers to a boil, reduce to low and simmer for 10 mins. Strain the juice from the mixture. 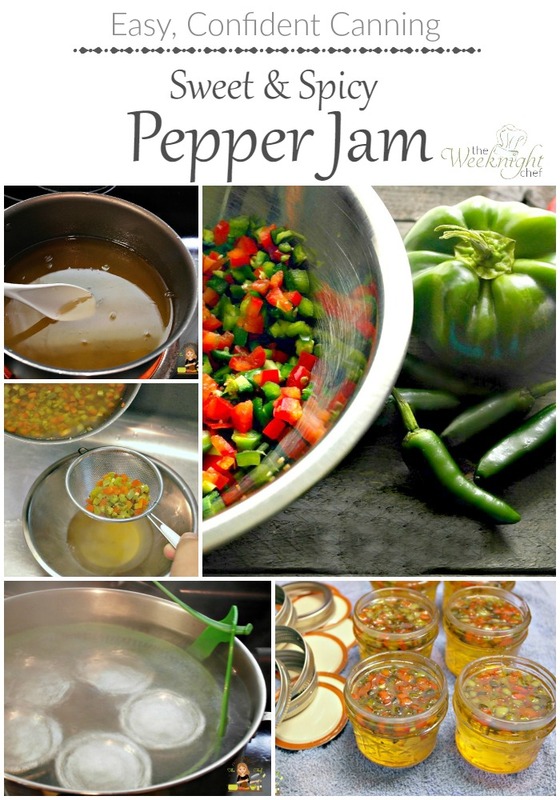 Reserve the peppers if you wish to have them in the jam, if not then discard. 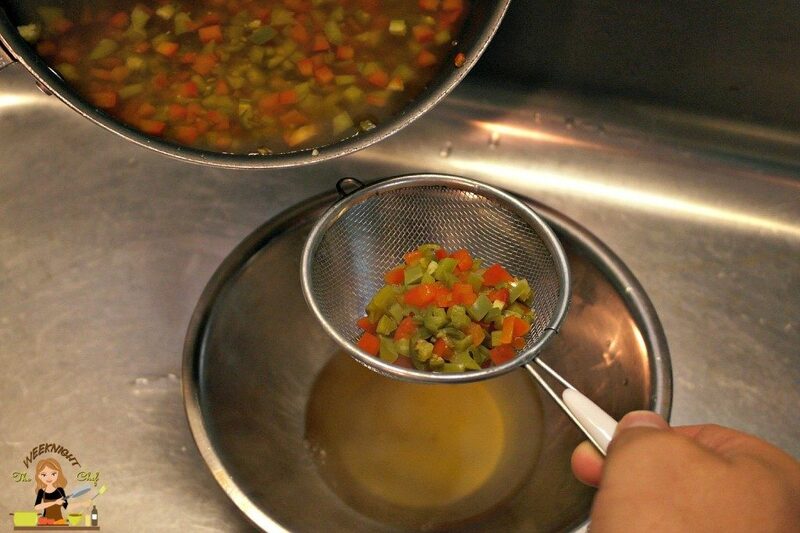 Rinse the sauce pan of any leftover peppers, add the liquid mixture (2 cups worth) back into the sauce pan. Bring it to a boil while adding the sugar one cup at a time. Mix constantly. Bring to a rolling boil. 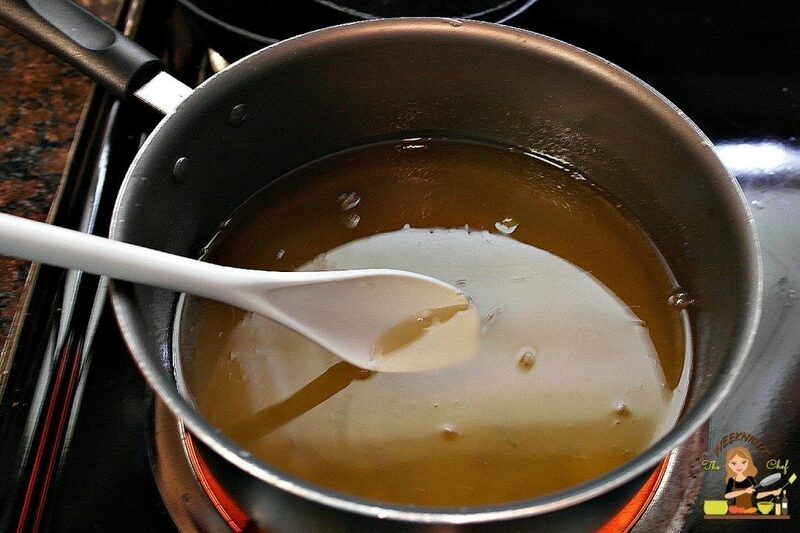 As soon as it is boiling, remove from heat, quickly stir in the pectin. Add back to the heat and boil for 1 minute. Remove from heat. DO NOT OVER BOIL. Jam will be “gummy”. If you want the peppers , add them in now. Then ladle into jars. Leave about 1/4 inch of what is called “head space” (space between the top of the food product and the top of the jar). 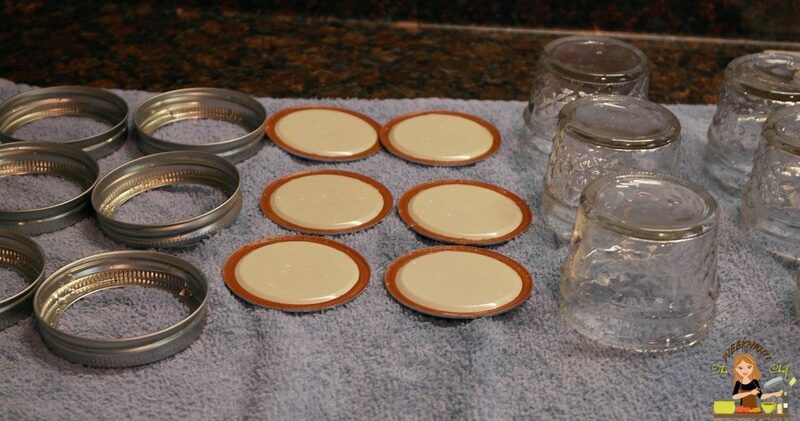 Using a clean cloth, wipe the rims of the jars. Add the lids and bands. Do not over tighten the bands, you want air bubbles to escape, hand tighten down just until snug. Bring a large pot of water to a rolling boil. Process jars for 5mins. Make sure the water completely covers the jars. Remove and let sit for 24hrs. 1. You will hear a “pop” from the jars, this is normal. 2. After 24hrs, any jar with a lid that flexes when you push down on the middle needs to be refrigerated and consumed within 2 weeks. This means it did not properly seal. 3. I chose to purchase these 4 0z. jars, they were ($9 for 12), you can also use 8 0z. jam jars. This recipe made 9- 4oz. jars. Serve with crackers, or spread over cream cheese on a bagel! 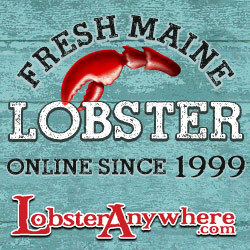 Summer in Maine (or actually any time of year) means Lobster. All things lobster. 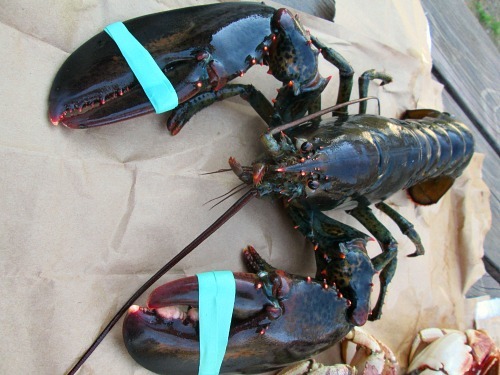 Lobsters boiled, steamed, lazy, fried, in a roll , you name it. 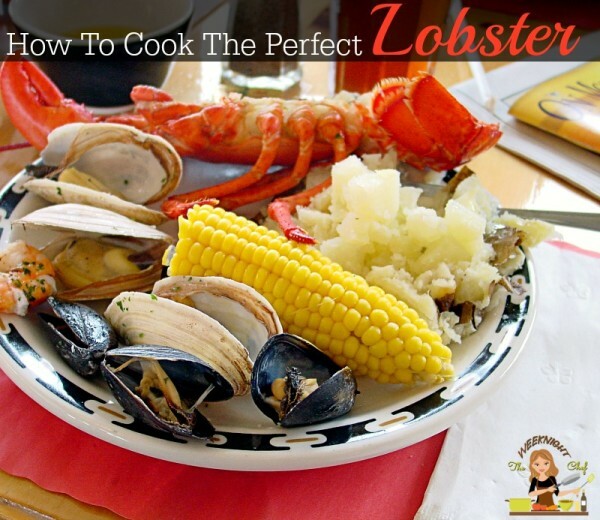 If you are a fan of lobster you may know it is one of those things that makes most people second guess themselves every single time before cooking. The first question is usually should I steam or boil? Then, for how long? I have cooked my share of lobster and still question it each time. The last thing anyone wants is an over cooked lobster. They are way too expensive for that! 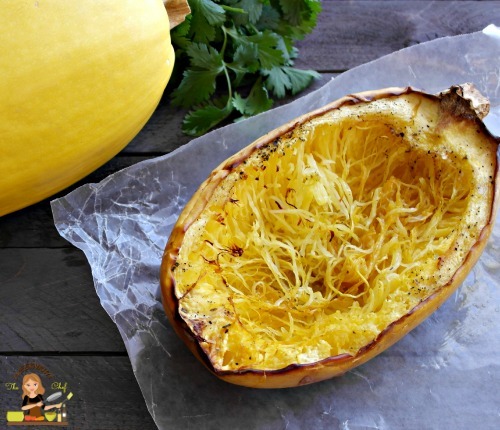 Spaghetti squash is kind of known as the low carb dieter’s best friend. Cook it, scrape it apart, top with sauce and Voila, instant carb free spaghetti. 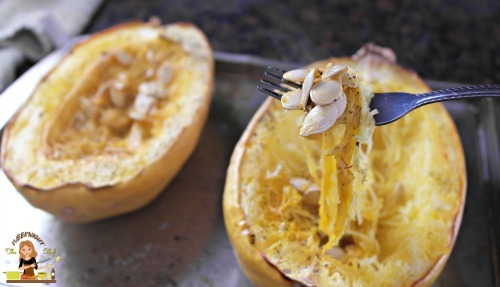 But, did you know this squash is fantastic just as it is? 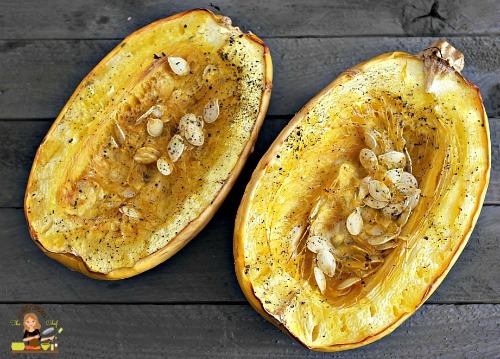 I’m one of those people who likes their pasta with butter and Parmesan, so simply roasting this squash is my favorite way to prepare it. 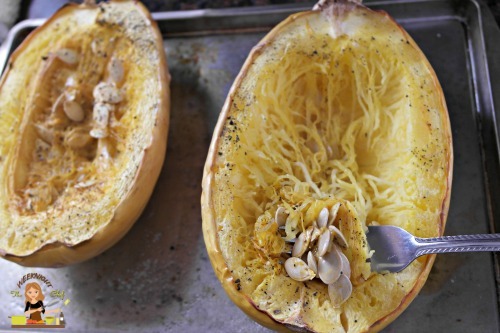 Either way, no matter how you plan to enjoy this spaghetti squash you can start with this roasting process. CAREFULLY cut the squash in half long ways, PLEASE take caution* this is a very hard squash. Do not scoop out the seeds yet, it is a lot easier to do after it has roasted for a bit. 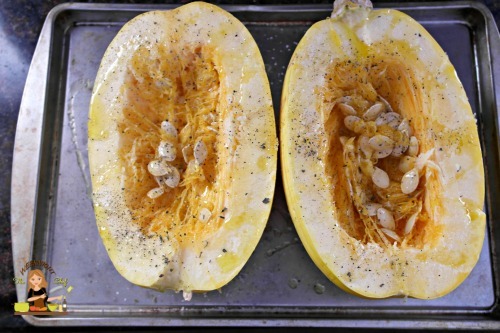 Roast the squash for about an hour, remove from the oven, it should look like the picture above. Use a fork and lightly scrape the top layer from one end to the other, all the seeds should come up with it. Discard the seeds and top layer. Loosen up the sides and bottom a little bit, return the oven and bake for 1 more hour. Scrape the squash out and serve as desired. I know I mentioned above that I prefer it without sauce, but I had to try it both ways! With as much as I cook , one would think that I have this nice, new, big refrigerator to hold all of my ingredients. I don’t. Mine is actually even smaller than the standard 18 cubic foot. This one was here when we moved in and I am too cheap to buy a new one, I figure it works so might as well wear it out. I had to come up with a few tricks to make this small refrigerator practical, the most important being how to keep my produce fresh. Especially with all of the vegetables we grow during the season. I was noticing a lot of wilting and premature rotting with the veggies in our “crisper drawer”. I quote crisper drawer because it is actually just a drawer. It does not crisp, nor does it preserve. 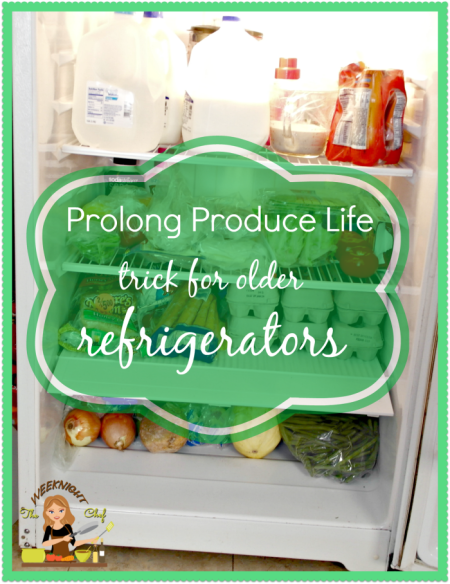 Here is an easy way to help prolong the life of your produce in a small (or older model) refrigerator. 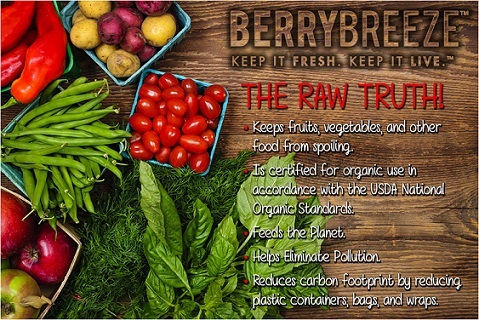 If your smaller or older model fridge lacks a humdity/temperature controlled crisper drawer follow these steps to help preserve your produce and keep it fresh longer. Remove the drawer. Use the space, but not the drawer. 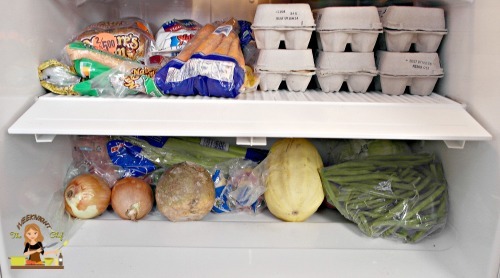 Cramming all that produce into the drawer prevents air flow and confines the natural gases fruits and veggies give off. This will ripen and rot your produce faster. Wet a few paper towels, ring them out, place inside of zip lock bag. Leave the bag open and sit it on the middle shelf in the back corner. This will add moisture to the air and help prevent drying. use two if you see in a week that one is not enough. Note: Removing the crisper drawer also keeps the product cooler, being stuffed into a drawer actually keeps them warmer just as if you cuddled up next to someone for warmth. In addition, If you have the room and want to spend the money it is also a great idea to buy one of those little gadgets that help keep product fresh. 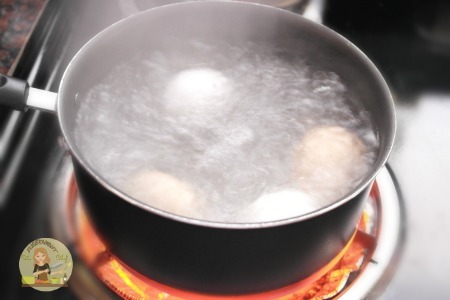 Hard boiling eggs is one of those things most of us have to stop and think about each time we make them. How long do I boil them? Did I boil these long enough? Can I peel them yet? Are they cooled enough? It can be difficult because you never know if they are cooked until it’s too late. 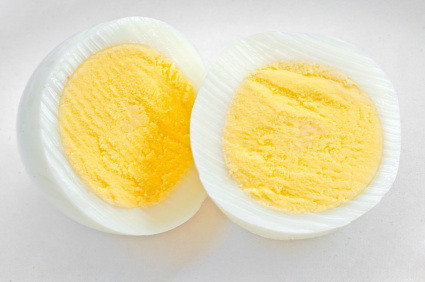 You cool, peel and cut open the egg only to find out the yolk is runny. I got so tired of this happening that I experimented until I got it just right. Having chickens made it a bit easier, endless eggs! 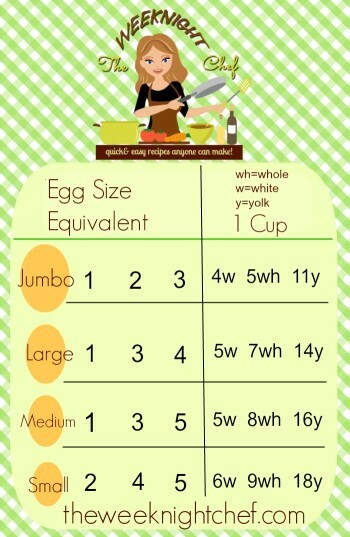 It can be easy to over cook an egg. If that happens the yolk will be hard and chewy, very unappetizing. 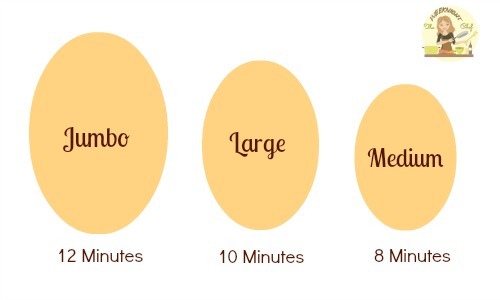 Follow these easy steps and you will have the perfect hard boiled egg every time. 1. 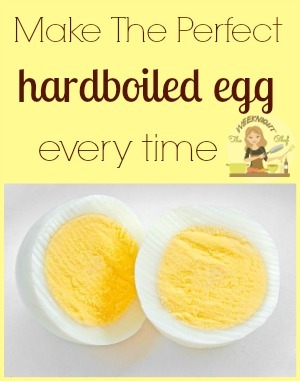 Place the eggs in a sauce pan and cover with water. Make sure the water covers the top of the egg. Bring to a boil. 2. 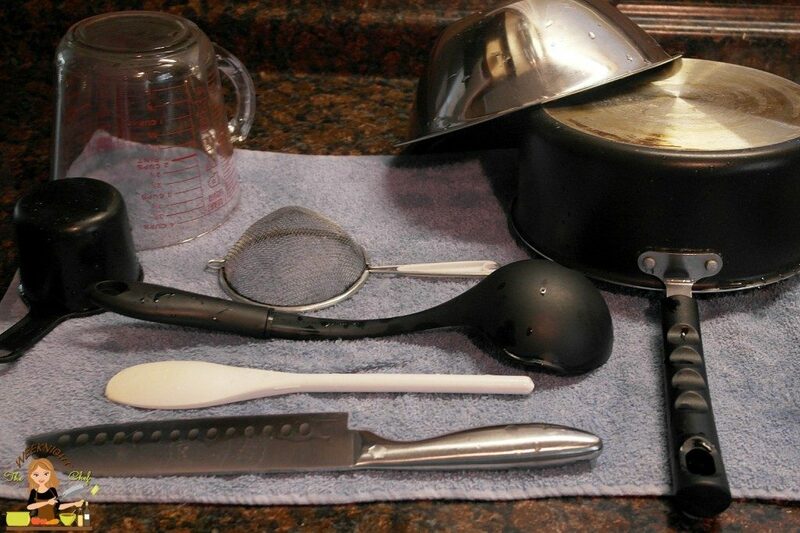 Immediately turn off the burner, remove the pan from the heat and cover. Follow the chart below: Stoves burners do vary and some heat hotter and quicker than others. So you may need to adjust your time. 3. 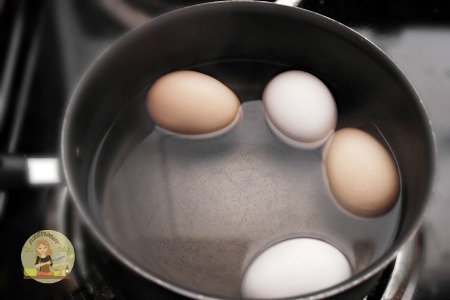 Place the eggs in cold water for 5 minutes to stop the residual cooking. Serve warm or refrigerate. To make peeling easier, do not over crack the egg. Tap it gently on one end, peel away the shell to form a circle, then use your thumb to peel, kind of like you would an orange. For A Soft Cooked Egg: Simmer gently on medium low, about 8 minutes. 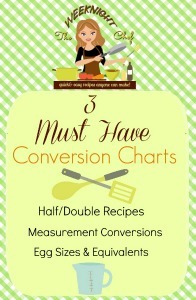 The following conversion charts will be your most important tool in the kitchen, well besides your stove. You may or may not think you will need them, but trust me… print them. save them. bookmark them. Do what you have to do, because once you have them you WILL use them. I created these from convenient magnet charts I made a long time ago. If you would like a collaged printable version or any edits to make it easier for you to print, please use the contact form to send me an email. I can edit these to fit on one page and even remove some color to save on ink! OR just bookmark and come back any time you need them. 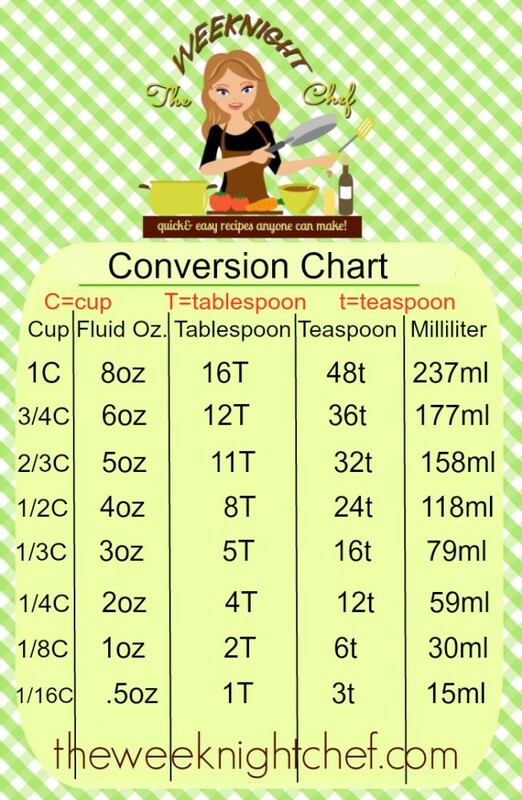 Conversion Chart: Basic conversions that will come in handy if you are limited on measuring cups or spoons. 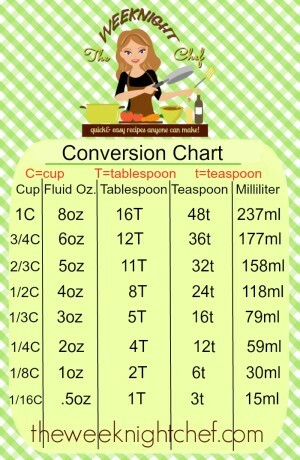 Also if you need to convert to fluid oz. or milliliters. I use this chart a lot more than I ever expected I would. 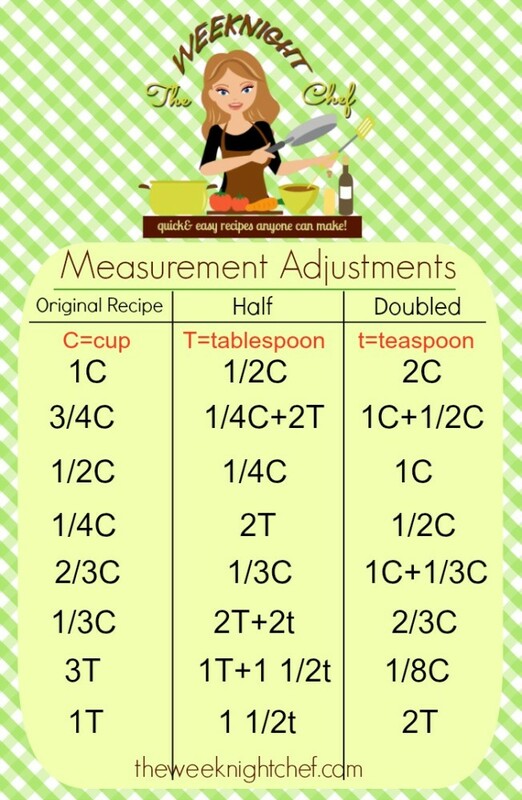 Measurement Adjustments: Got a recipe you need to cut in half or double? 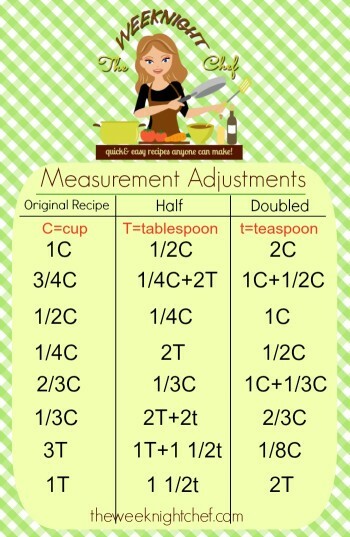 Doing math while trying to cook can be overwhelming … who wants to do math when they are cooking? You just end up doubting yourself, adding more or less than you need and then screwing up your recipe. Follow this chart- it is 100% easier. 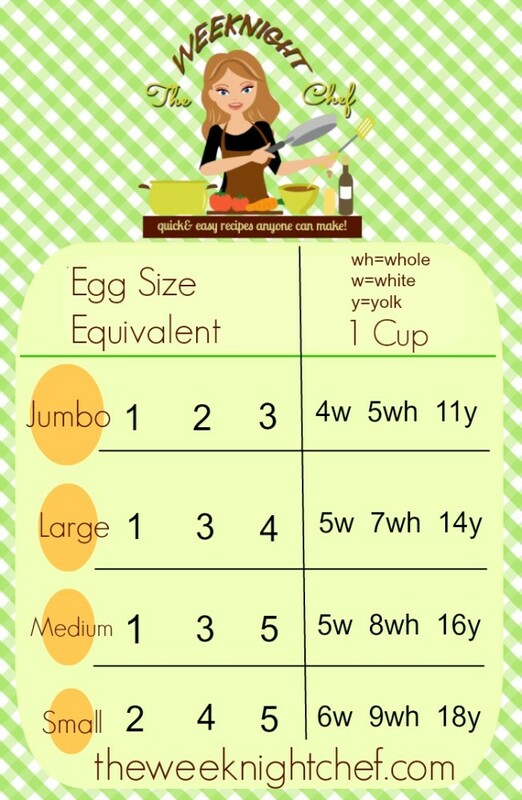 Egg equivalents: have a recipe that calls for 3 large eggs? Only have small eggs on hand? Easy enough… just take a peek at this chart to know what you need.